If I Don't Eat Rice Will I Lose Weight? Many women can't bear the idea of giving up pasta to lose weight. Fortunately, you might not have to. Pasta can fit better into a weight-loss goal if you exercise, choose whole-grain pasta and create a healthy meal out of the pasta, instead of one drenched with fat and calories. Whole-grain pasta is a healthier choice than regular pasta made with refined white flour. Whole grains help you lose weight better because they include the fiber found in the plant. Conversely, refined grains lose the fiber during processing, so the original vitamins and minerals in grain are lost. While these nutrients are generally added back in, you end up with nutrients that are synthetic. The fiber in whole grains helps you feel fuller longer, whereas when you eat refined grains, you are likely to eat again soon after. Whether you have whole-grain or refined pasta, pasta itself is low in fat and calories. 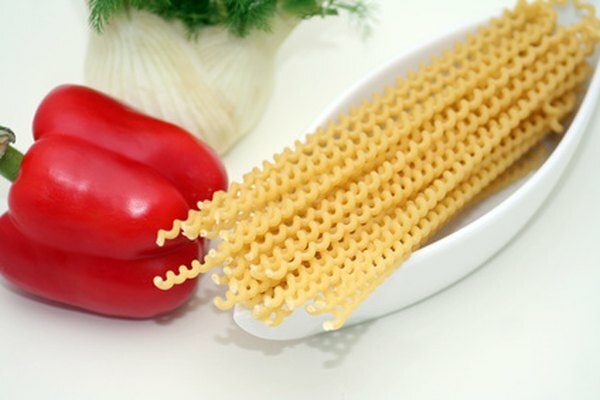 Semolina flour, the flour used in refined pasta, is a strong source of protein. Each 2-ounce, or two-thirds cup, serving size of pasta made with semolina and durum flour has 200 calories, 1 gram of fat and no cholesterol. It contains 2 grams of fiber and 7 grams of protein. The same amount of whole wheat pasta contains 190 calories, 1 gram fat and no cholesterol. It has 4 grams of fiber and 8 grams of protein. Instead of filling your plate with pasta, include lean meat or seafood and vegetables, either on the side or mixed into your pasta. Slicing chicken into the pasta enables you to use a healthier serving size. Use grilled chicken instead of a breaded, fried breast with cheese. Top pasta with tomato sauce or olive oil instead of a cream or cheese sauce, and add vegetables such as mushrooms, broccoli and spinach to the sauce. Use parmesan cheese, as it generally has less fat and has a strong taste, so you don’t need as much as other cheeses, such as mozzarella. Pasta might be a smart choice if you are exercising intensely to reach your weight-loss goals. The American Council on Exercise explains that “noodle dishes remain the No. 1 preferred and dietician-approved way by athletes to load up on carbohydrates and help maximize muscle glycogen (carbohydrate) storage in the muscles.” This is recommended for workouts of more than 90 minutes. Some athletes prefer low-fiber white pasta, whereas others want the fiber in whole-grain pasta. Talk to your personal trainer or health professional for the best choice for you. Does Rice Cause You to Put on Weight?